Pregnancy and the birth of a new baby can stir up many different feelings for mothers, fathers and other family members. For mothers, it may bring up thoughts of whether they will love this baby as much as their first. Confidence comes with experience, and many second and third time parents find being a parent again, easier. They feel more confident and relaxed. It is important to include your toddler in the lead up to the arrival of your new baby. Siblings will figure as one of the most important relationships in your baby’s life – this relationship is usually longer than the parent-child relationship – so it is important that it gets off to a good start. As the date of the birth draws near, being organized will help reduce some of the stress that comes with the arrival of another baby. Visit friends with babies, start some role-playing with dolls, feeding and putting baby down to sleep. Share stories and pictures of your older child when they were a baby. 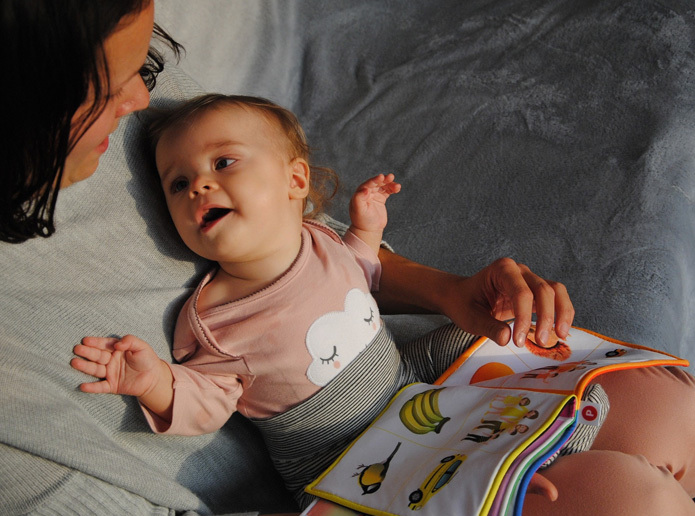 Make a sibling story book so when the baby arrives they can tell the story to the baby about his big brother or sister. The sibling can possibly read to the baby too because that is a very important job. Discuss with your toddler if they are happy to give up their old pram to the baby? Are you buying a double stroller? If so, get your child to sit in the stroller and then put a dolly in the stroller to represent the baby. Get your toddler used to the new stroller before the baby arrives. If it is planned that your child will go for a sleepover on the night the baby is born, help them by practicing sleepovers beforehand. If you are planning to move your toddler from a cot to a bed, do this before the baby is born, so there is no resentment towards the baby. Continue normal routines as they help to give toddlers a sense of security. They like to know what is coming next. Allow children to express their feelings by helping them put words to their emotions. It is a good idea not to have the baby in your arms so you can give your toddler a big cuddle. Make a fuss of them before introducing them to the new baby. Take hints from your toddler, who may be shy at first. You might say, “Would you like to see baby’s little feet? You used to have such tiny feet like that. Would you like to stroke them?”. They might be keen to hold the baby, but don’t push it if they are not. Make sure they know you will still love them now the baby has arrived. Take a photo so your toddler can show everyone they have a new brother or sister. New babies are often showered with gifts and toddlers might feel put out. Some new books or appropriate toys as a present from the baby might help any relieve any potential resentment. Coming into a hospital might be a new experience for your toddler. They may be shy or anxious seeing you in your pyjamas during the day. They may become upset if they see their mum with drips and drains attached. Consider planning the first visit after these are all removed. Toddlers have short attention spans and hospital rooms are pretty boring, so organising an activity box with things to keep them entertained is helpful. Snacks to satisfy little appetites often go down well. If your partner or helper is bringing your toddler late in the afternoon, you might like to do your bedtime routine in hospital. Having a shower in mum’s bathroom and then a book to read before they go, can normalise their life and makes it easy for dads when they get their toddlers home and ready for bed.